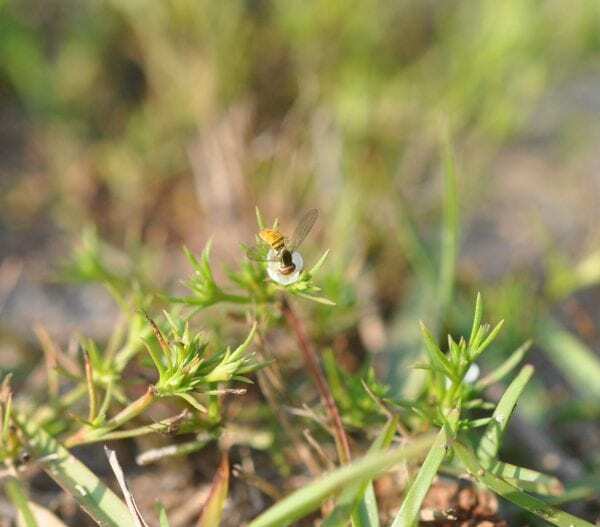 Protecting Pollinators in Urban Areas is a four-part series providing information and recommendations for the protection of pollinating insects in urban landscapes throughout the Southeast. Animal pollinators can be birds or even bats, but the most abundant are insects. The first in the series focuses on the ecology of urban pollinators. You will learn about the many species found in urban areas and the issues concerning their diversity and abundance. Urban landscapes are transforming traditionally rural areas in the southeastern states into suburban and urban centers. Significant changes to plant and animal communities are a consequence. Plant species diversity often increases in suburban areas versus rural or urban (city center) areas. On the contrary, animal species diversity is considerably less in suburban and urban areas relative to adjacent rural areas. As urbanization continues to alter the landscape, changing habitats provide challenges for pollinators. It is more difficult for them to thrive in areas where fewer nest sites and host plants are available. Man-made structures and traffic make foraging riskier and more difficult. Knowing how to protect vital pollinators begins with understanding their ecosystem. In Alabama and most of the southeastern United States, spring is often marked by the pine pollen on your car, patio furniture, and house. Pine trees produce and unload so much pollen because they depend on the wind to do their pollinating. This is a big reason to be thankful for bees and other animals that do the pollinating for plants. It’s a much neater process! This brings up the question: How do animal pollinators know to go to flowers for pollination? Most flowering plants have specific floral traits (color, smell, size, rewards) that attract certain pollinators. Some pollinators focus their attention on one plant species, a behavior known as floral constancy. Remaining true to the flowers they visit increases the chance for successful pollination. Animal pollinators and plants depend on each other for survival. Figure 2. 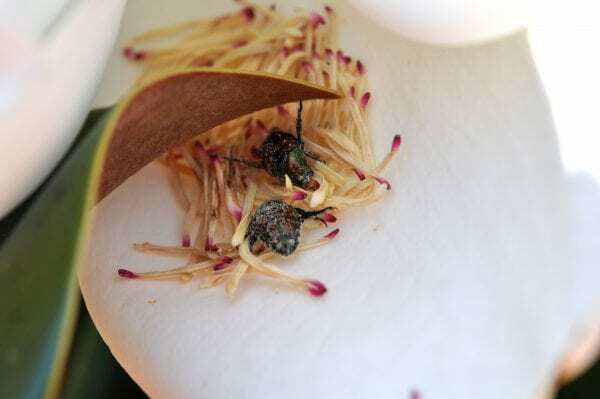 Flowers with strong fruit or flower scents attract beetles that may accomplish pollinations. Figure 1. 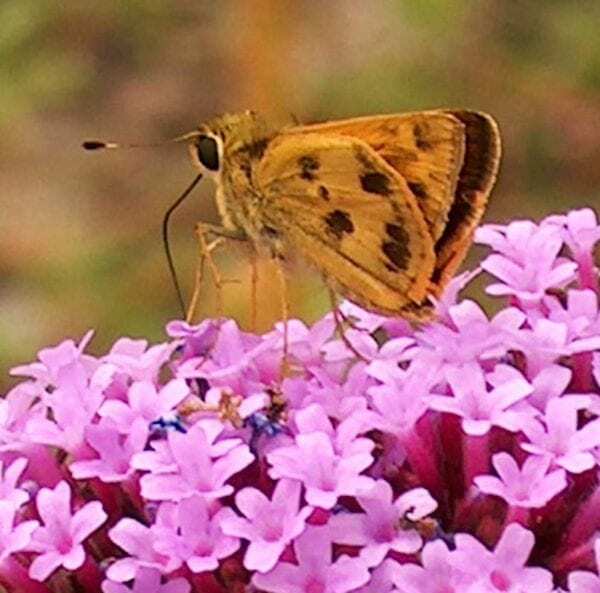 Skippers are one type of butterfly that can be a pollinator. People tend to think of the European honey bee (Apis mellifera) when they hear the word pollination. But it is just one species among approximately 3,500 species of bees in North America. 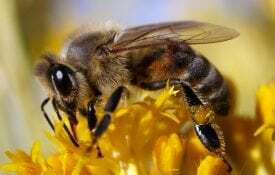 Moreover, the European honey bee is not native to North America. It was introduced by early settlers and is considered an agricultural commodity. Moths are night active and pollinate flowers that are open. They work when most other insect pollinators are sleeping. Butterflies (fig. 1) are not as efficient as bees at moving pollen, but they can visit long, deep flowers that may not provide accessible nectar for some bees. Beetles (fig. 2) are mess and soil pollinators. 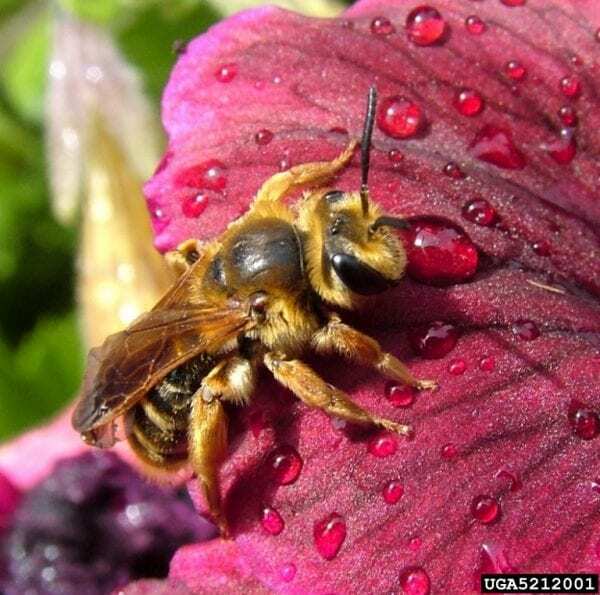 They get inside flowers and move around, coating their whole bodies with pollen. Figure 3. Some hover flies are bee mimics. They visit flowers and can be pollinators. Flies (fig. 3) find their specialty in stinky flowers. No other pollinator wants to go to a flower that smells like rotting flesh. Ants on flowers are more likely stealing nectar or hunting insects than pollinating. An exception is the small stonecrop (Diamorpha smallii). It is a native plant to the southeastern United States that is ant pollinated. 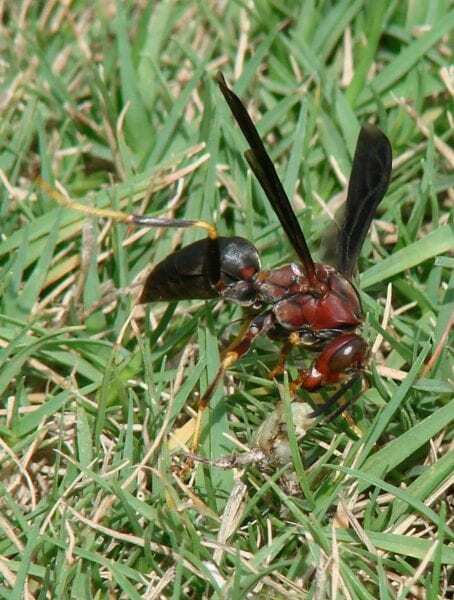 Wasps (fig. 4) are often seen with bees at flowers. Because their bodies are not hairy, successful pollination is usually limited to specialized species such as fig wasps. Without these wasps, tropical fig trees grown as ornamentals would not produce fruit. Among insect pollinators, bees are the most common and abundant. Many other insects are attracted to flowers to feed, but may not achieve pollination. Or, they may move pollen on their bodies, but not follow floral constancy. For these reasons, the remainder of this publication focuses on the ecology of bee species. Bees as a group are unique in that they all have adaptations specifically for collecting pollen. Bees lack a “thread waist” like you see in wasps and ants, but they are closely related and are in the same insect order, called Hymenoptera. Male bees, when present, are only available for mating and lack the ability to sting (despite inaccurate depictions of male bees with stingers in animated movies). Bees can be grouped taxonomically into families, but ecologists often refer to them as either long tongued or short tongued. Long-tongued bees typically have longer mouthparts that allow them to get nectar from flowers that are deeper. Bees gain nectar or pollen as rewards from flowers. In return, bees cross-pollinate plants, which ensures fruit production and increased diversity. Nectar from flowers is consumed as food by virtually all animal pollinators. It provides primarily liquid sugars that are used as their “flight fuel.” Nectar also is used to produce honey and to feed immature bees. For honey bees, greater than 90 percent of the food for bee larvae and nurse bees comes from nectar (honey). Other bees, not just honey bees, either make small amounts of honey or collect nectar and mix it with pollen to feed to developing bees. Nectar may only be available to pollinators for a limited time during flowering, even though the flowers themselves may remain open. Nectar can be replenished by plants in nectaries, if water and sugars are available. Under drought conditions, plants may conserve water and reduce or stop replenishing nectar. Few studies are available on the subject of drought and nectar production. However, keeping flowering plants watered during time of drought may be a good practice to ensure that nectaries replenish nectar for pollinators. Pollen is equally as important as nectar for the growth and development of all bee species. 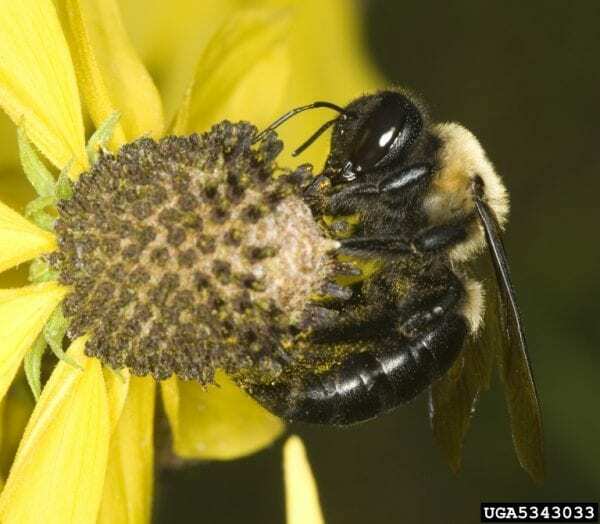 Unlike other pollinators, bee species, such as bumble, honey, carpenter, and leaf cutter, use pollen as another food for developing larval stages. It takes about 0.5 ounces of pollen harvested by worker honey bees to produce 100 new workers. Not all pollen is the same to pollinators. Pollen of different plant species varies in quality and quantity. Bumble bees, for example, prefer flowers where the pollen has a higher proportion of protein to fat (lipids). Because of this variation, pollinators can be grouped by the range of plants visited to collect pollen. 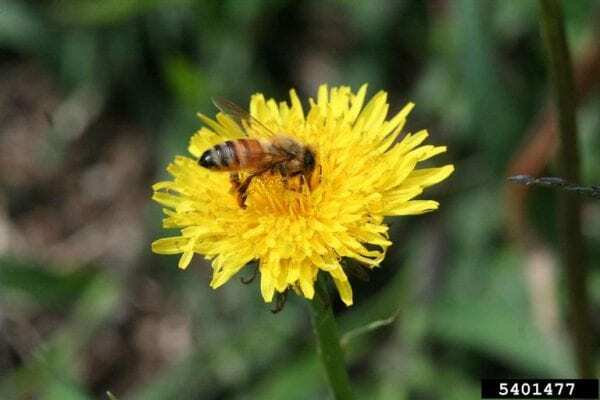 Some bees collect pollen from many different species of unrelated plants (polylectic); others are more specialized, only taking pollen from a few related species (oligolectic) or one or two species (monolectic). 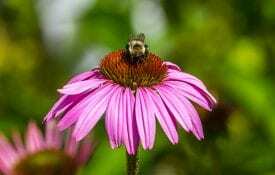 The majority of bee species in North America are polylectic. Bees that use fewer flowers, however, are more closely tied to those plants for preservation and conservation. Take the monolectic bee, Hesperapis oraria, for example. It only exists in the southeast coastal areas of the United States and uses coastal plain honeycombhead as its only pollen and nectar source. Only landscapes (natural, roadsides, or urban gardens) that have this particular wildflower will have a chance of seeing this rare bee. As with many specialist bees, restricting or eliminating the host plants will, by default, limit the abundance of the bees. Figure 5. Bumble bees are native bees common on many flowering plants in the landscape. Queens are larger and are seen on flowers in spring and fall. Bee species are grouped into six insect families: Apidae, Andrenidae, Megachillidae, Hallictidae, Colletidae, and Melittidae. The family Apidae includes the species that most people associate with the word bee: bumble, carpenter, and honey. Bumble bees (fig. 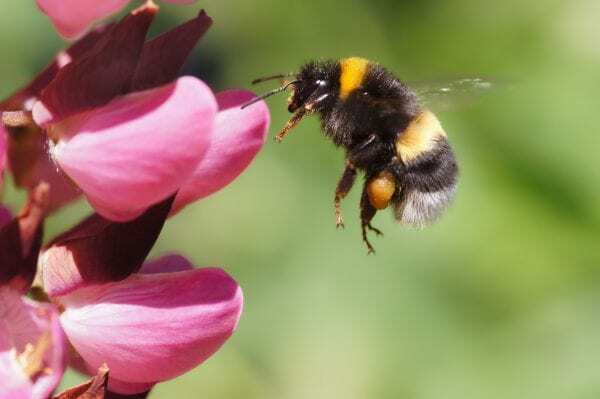 5) are robust bees with hairy bodies that nest in the ground. Carpenter bees (fig. 6) are also large but nest in wood. These bees are considered pests in urban areas, since they will make nests in deck or fascia boards on homes. 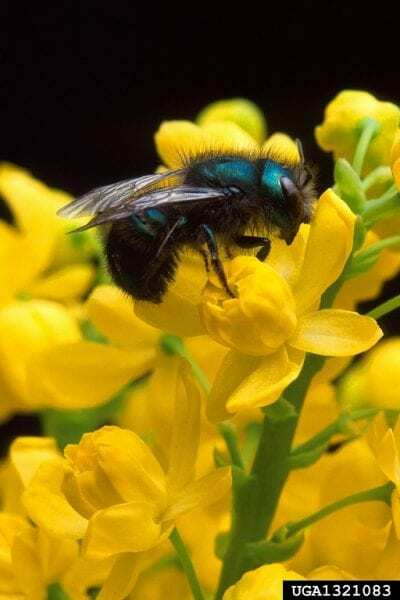 In spring, carpenter bee males may hover at head height in areas where females are making nests. Male carpenter bees can’t sting, but large bees hovering so close to people can be startling. Honey bees (fig. 7) are smaller and mostly yellow to orange in color. They are typically seen in large numbers on flowering plants. The family Andrenidae, known as mining bees (fig. 8), has the most species of any bee family. New species are being discovered almost every year. Mining bees nest in the ground and are active primarily in the spring. 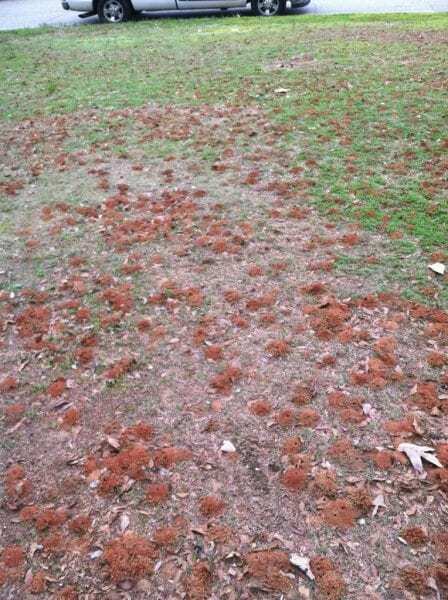 Their presence often alarms homeowners due to the holes they burrow in bare areas of grass (fig. 9) and the large number of males that swarm in these areas. Don’t be alarmed if you see this. Most of the bees that are visible are males that lack the ability to sting you. 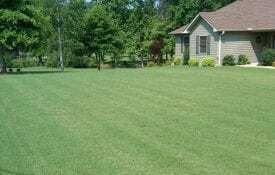 They also are not killing the grass; they are simply taking advantage of bare areas, generally where grass has thinned under trees or on slopes. Finally, there is no need to spray them. Mining bees only swarm for a few weeks. If this is unnerving, however, you can water the area; this generally encourages them to move elsewhere to nest. The family Megachillidae includes leaf cutter and mason bees. They are known for covering the cells of their developing larvae with materials in the environment, such as dirt (mason bees) (fig. 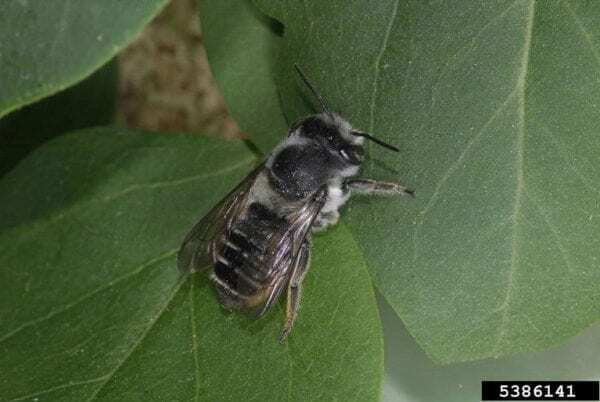 10) or cut leaves (leaf cutter bees) (fig. 11). Some species of bees in this family also nest in the ground like mining bees, but other species nest in cavities in wood. One unusual nesting place for mason bees is in small cracks or cavities in the mortar of brick veneer on buildings. Leaf cutter bees cut small circular areas around the edge of leaves. They are particularly fond of native redbud trees. 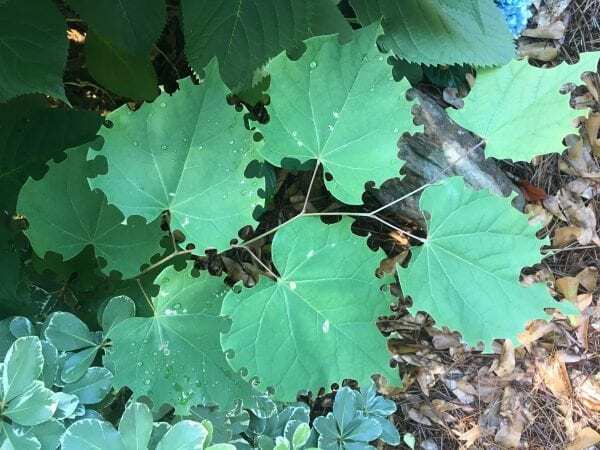 They make almost perfect circular holes along the edge of the tree’s heart-shaped leaves (fig. 12), usually in late spring or early summer. The amount of leaf material removed is small, and the tree will never be defoliated by leaf cutter bees. This leaf damage may be confused with feeding damage by caterpillars or leaf-feeding beetles. But leaf-feeding beetles and caterpillars rarely just feed at the edge; they continue to consume the rest of the leaf. Their feeding may partially or completely defoliate a tree. The family Hallictidae (fig. 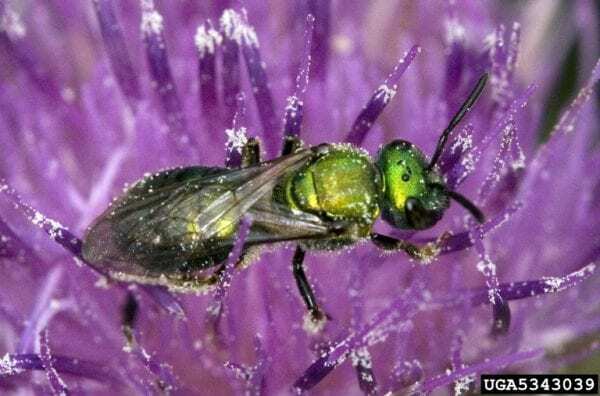 13), or sweat bees, often have a metallic green color. The metallic color and the presence of pollen brushes make these bees easy to recognize at flowers. Its common name comes from the fact that some of the species are attracted to and drink sweat. Sweat bees can deliver a sting (often not painful but surprising) if you swat or squash them. The family Colletidae (plasterer, cellophane, and masked bees) and the family Melittidae have fewer species than the other families, making them less studied. Many species are floral specialists and have restricted geographic ranges in North America. Many urban landscapes do not rely on successful pollination for plants to continue from year to year. Pollinators may be important to ensure fruit set for certain fruits or vegetables in backyard gardens, but we don’t typically rely on fruit set or seeds to maintain landscape plants. People may choose to keep honey bee hives or even create various nests in urban environments for this purpose. Beekeeping, although declining nationally over the last 60 years, is becoming trendy again in urban areas. If you are interested in beekeeping, check with your local Extension office for resources or publications specifically for backyard beekeepers. Get started at www.aces.edu. Apart from beekeeping or backyard gardening, urban spaces can be particularly important for pollinator conservation. It is a logical connection: Horticultural industries produce flowering plants for function and aesthetics in urban landscapes, and bees need flowers. 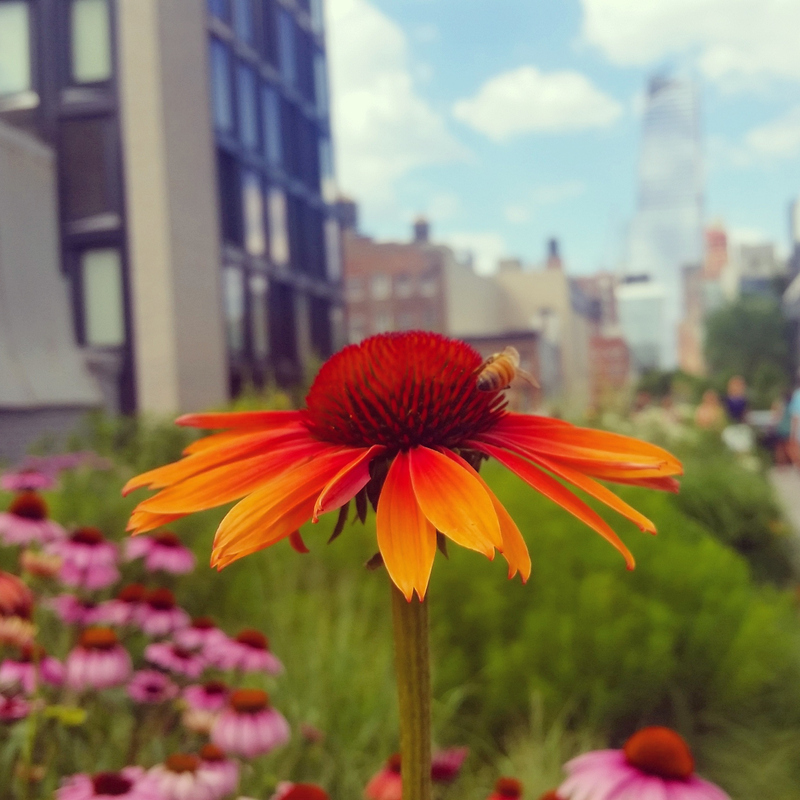 By outlining how urban landscape management interacts with pollinators, our goal is that urban planners, arborists, landscape architects, and homeowners will make choices to positively influence urban pollinators.